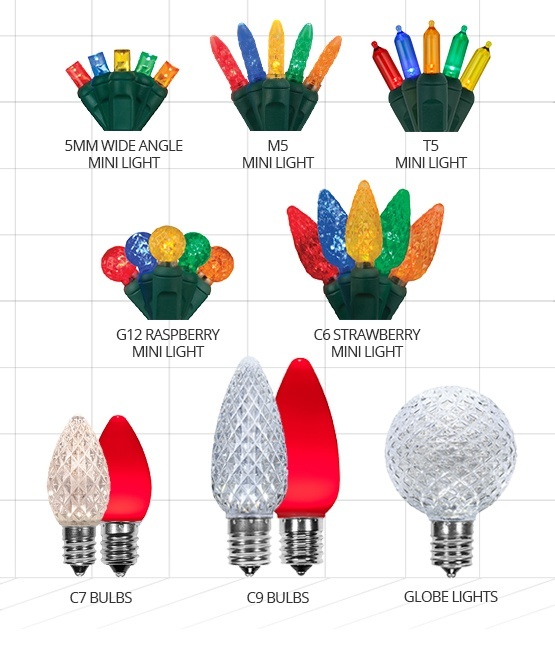 LED mini Christmas lights available in a variety of bulb sizes: 5mm, M5, T5, G12 and C6. Ideal for decorating bushes and wrapping trees, posts or railings. Traditional C7/C9 look with all the benefits of LED: energy efficient, durable, long lasting lights. 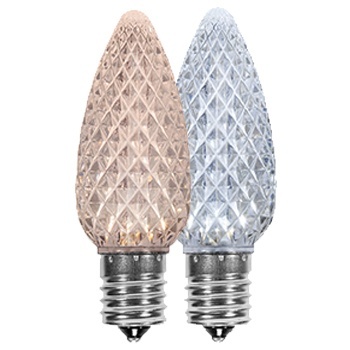 C7 and C9 LED Christmas Lights available in prelamped sets or replacement bulbs. Popular uses include lining walkways, roofs and decorating evergreens. LED Net Lights provide quick and easy installation and professional looking displays. Vivid colors in 5mm or M5 bulb shapes, and as net or trunk wraps. Great for lighting your bushes, tree trunks and columns. Simulate falling snow with the dripping LED light effect of Grand Cascade lights. Colorful cascading lights and molded icicle bulbs. Use as outdoor Christmas lights to create eye catching displays. Bring the brightness of LEDs to your Christmas light decorations. Choose from lighted snowflakes, stars, elves and Santa, all in vivid LED lights. Hang from trees or place in the yard for the best outdoor Christmas displays. White or color lights in 5mm, M5 and snowflake shapes. Popular choice for rooflines, accent lighting, and as wedding lights. Choose from three shades of white for ambiant lighting or RGB multicolor LED strip light for ultimate customization. Illuminate large spaces with long runs of LED rope light that stay cool to the touch. Brilliant hues in more than 15 colors with chasing or steady light. Outline walkways, buildings and rooms, wrap railings and posts, and shape into letters or signs. Commercial LED strings feature water tight sealed connections and heavier gauge wire for the most dependable performance. Bulb sizes include C7, C9, 5mm, M5 and more. Use with commercial LED accessories for custom projects. Bright LED lights add sparkle with minimal power consumption. Sizes range from 4' to 12' with several color options. Dazzle your neighbors with LED lightshow trees in your yard! LED lights extend battery life up 100 hours. Choose from fairy lights, 5mm LED battery lights, and more. Use LED battery powered lights in crafts, weddings, and holiday decor. Commercial LED Christmas bulbs and heavy duty socket wire. Best selling light sets in C7 and C9 bulbs. Easy to buy and long lasting for years of indoor/outdoor use. Where there's an LED, there's almost always an exclamation about energy savings. LED lights do save energy and that is awesome - not only are you helping the environment, but you'll save some money on your power bill too. But quality LEDs are also an investment and the initial cost can be higher than incandescent lights, so instead of only highlighting the energy savings, we think you should know the other real benefits you can get from making the switch. LED bulbs produce a brighter more vivid light than traditional incandescent bulbs. The light output is really stunning and one of the most complimented aspects of LED lights in customer reviews! First, they're rated to last tens of thousands of hours which means no burnt out bulbs! Second, many LED lights are made with durable acrylic lenses which makes them incredibly hard to break. So if you're up on the ladder trying to hang Christmas lights and a light bulb decides to take a dive, there's no more shattered mess and the bulb will still work even after it has fallen. If you've ever tried to change an incandescent bulb too quickly you know how warm these lights can become, and while that might be okay for use outdoors, the indoor applications are limited. Unlike incandescent lights and traditional LED household bulbs, LED christmas lights are cool to the touch so they're safe to use around children and animals and perfect for DIY craft projects. This opens up a whole new world of indoor decorating possibilities! LEDs are available in a kaleidoscope of colors and several varieties even feature unique light display capabilities such as being dimmable and color changing. The newest RGB LEDs are even capable of thousands of light color combinations! Most traditional Christmas light strings only allow 3-5 sets to be connected end to end whereas with many LED strings you can connect between 40 and 50 sets together depending on the light count. This can equal as much as 1,500 feet of lights! So, if you need to create a large light display, LEDs will make planning and installation so much simpler! If you're torn between choosing the benefits of LED lights or the classic look of traditional incandescent lights, you might be happy to hear that you can have the look you want and the long life, energy savings and vivid light output too! There are plenty of LED light bulbs and strings designed to mimic vintage style Christmas lights, no compromise required. There are hundreds of options in LED lights, so trying to decide which ones to use can seem overwhelming. From the variety of colors to light styles, the options you choose ultimately come down to personal preference, however some lights do lend themselves better to certain types of displays. To help you navigate through deciding which LED lights to purchase, we've provided answers to a few of the most common questions customers ask about LEDs. If one light goes out do I lose the whole string? No! Because LED bulbs are often rated for thousands of hours, it is rare for one to go out. However, if a bulb does go out on your string, the rest of the bulbs will stay lit! Warm white LED bulbs emit a golden glow that closely mimics the light tone produced by incandescent lights. 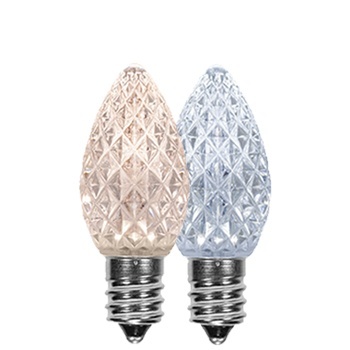 These bulbs work well inside and outside and pair well with red lights for red and white themed Christmas displays. Cool White LED lights produce a bright white glow which is perfect for mixing with other colors and can be seen from greater distances in outdoor settings. Popular color combinations for use with cool white LEDs include blue, red and green LED light bulbs. Cool white also pairs well with silver accents, snowflakes and winter wonderland themed displays. What is the difference between C7 & C9 LED bulbs? C7 bulbs are smaller than C9 bulbs. C7 light bulbs are an ideal size for wrapping columns, tree trunks and Christmas trees. These small bulbs can also be used to outline door frames or larger windows. C9 bulbs are popular for outlining driveways and walkways and are most commonly used as roof lights. If you've purchased LED lights from a big box retail store you may have noticed a faint flickering in your light sets. At Christmas Lights Etc., we carry only high quality LED light strings that are engineered with rectifiers to help distribute the flow of current on the string and eliminate the pesky problem of flickering bulbs.